This weeks Fanduel optimal lineup includes players from Thursdays a game. I did this specifically because I want to get Ingram and Graham in a couple lineups. Otherwise, I do not typically play Thursday tournaments on Fanduel because they lack a player swap feature. My concern is, someone I locked into a Thursday tournament gets hurt before their game on Sunday and then I'm screwed. As seen in the below lineup I locked in Jeremy Hill; I'm confident Hill will play in place of Gio in week 9 but if Gio doesn't sit out I could be taking a huge hit playing Hill. However, his low salary of only $5,200 is to great to deny. I don't mind risking a few dollar for cheap upside in a couple lineups. Gio's and Hill's projected fantasy points will change drastically in our next update. It's looking more and more like Gio will sit this one out. Why do I like Jimmy Graham? He has dominated Carolina for the last several years. In the image below you can see his dominance is undeniable. Is he risky due to his health? Ya? Will he be okay, probably so. If you want less risk you can pay $800 more for J. Thomas in Denver, more on that later. You can use the player versus team tool on all of our player pages. Just click the play names in our articles to get there or use the search feature in the upper right bar of our website. Now for the moment you've been waiting for, my customized Fanduel optimal lineup. Play at your own risk because like I said before this lineup has two risky plays, especially on Fanduel. Hill might not be the featured back this week and Graham isn't 100 percent healthy. Lafell will not be in a ton of my lineups this week but he has a enough upside in what might become a shoot out. I know NE vs DEN is projected to be the highest scoring game of the week but it doesn't always work out that way. Remember Packers vs Lions a couple weeks ago? How about Saints vs Packers last week? I can see NE doing an exceptional job slowing down Sanders and D. Thomas, which is why I'll have J. Thomas in a ton of my lineups and you should too. Our optimal lineup tool for Fanduel is very inexpensive and comes with a free trial. We only include the consistent and high upside players for the week. We remove the Thursday players from the pool on Friday morning so you can work on your Sunday lineups. We've added more stats to help you make a logical lineup each week and take the guess work out of staying below the salary cap for your team. 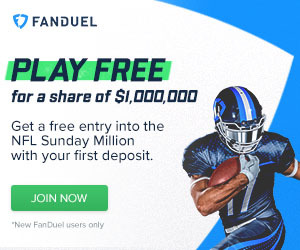 Our Daily fantasy tools save you time and help you win more money on Fanduel and DraftKings.